What a nice souvenir. It left me searching my memory: when was the last time a real sales clerk helped me in a store? I can’t remember. They used to be the ones to run back and forth, finding different sizes, a better color, and so on.They didn’t just stand at a cash register and ring up purchases. In a way, having sales clerks was like having a fellow provide “full service” at a gas station. It’s been a long time since I’ve had a sales clerk who provided lots of assistance. It seems like clerks are few and far between even in the big (somewhat upscale) department stores. That is so cool to have this article!! Luckky you! I especially like this article because it includes her photo and a handwritten note. Does the handwritten note suggest to you that Marian would have preferred to stay out of the limelight? I hadn’t thought about it in that way before, but now that you say it, I think you are right. She didn’t want family members to think that she was bragging by sharing the newspaper article with them. Times sure have changed. . . I wonder what Aunt Marian would have thought of facebook, selfies, etc. I am sure she would have been intrigued by Facebook but perhaps would not have indulged in selfies. Great memento! 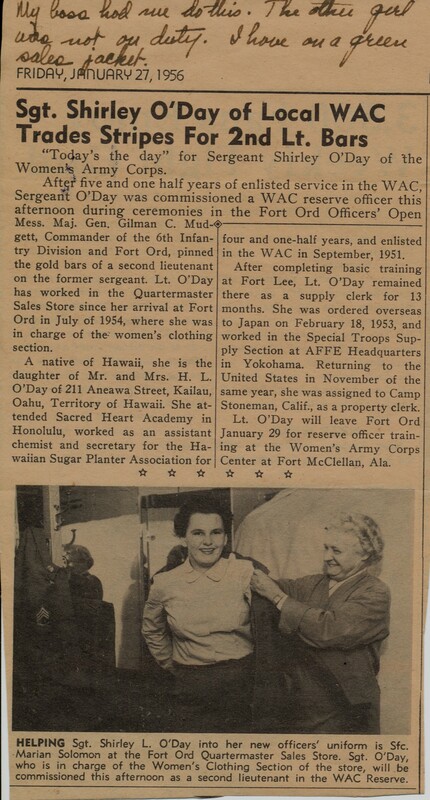 Interesting that Ms. O’Day enlisted while Hawaii was still a US Territory. I agree with Gallivanta that the note suggests that your aunt did not want to be seen as someone “hogging the limelight”! Wow, does that remind me of my own mom! She does look happy. 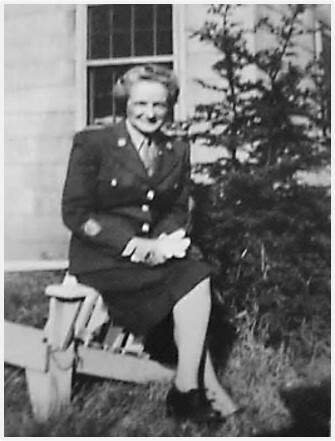 From everything I’ve ever heard, Fort Ord and the time she spent in Occupied Japan (I haven’t gotten to that part of her story in this blog yet) were her favorite posts. I was an army brat at Ft. Ord – great base! Wow. . . I want to hear more. The Monterey Peninsula is such an awesome setting for a base. I like the idea of working in a commissary–you’d get to see lots of people and have first dibs on the merchandise! It’s so great that you have this clipping. It does sound like it would be a fun place to work. Oh, that’s neat. Fort Ord is not far from here. From everything I’ve ever heard, Fort Ord was Aunt Marian’s favorite place to be stationed. You live in a beautiful section of California. It is a nice picture of her. The comment thread about getting help from sales people reminds me of being helped with purchasing shoes. Remember? They’d bring out a stack of boxes of different shoes, in various styles and sizes? Haven’t had that happen since I was a child. There was so much more emphasis on service back then–and the clerks were very patient . It always seemed like they had an almost endless supply of different styles they could bring out. Hello Sheryl, nice to be with you again. Trying to find out how to follow. Will work it out!! Welcome–I’m glad you found my new site. I’ve missed you. The formatting of this blog is slightly different across various devices and browsers. On laptops I think that the follow button is generally on the black bar at the top of this blog.